The 2010 Volkswagen Passat has taken yet another step forward. This time in the form of a revised engine range, additional features, and most significantly, a new entry price, thereby setting a new benchmark amongst the large well-appointed European cars. The 1.8 litre 118TSI engine with 118 kW of power and 250 Nm of torque is now available as the new entry model into the Passat range ensuring remarkable performance combined with superb fuel efficiency. 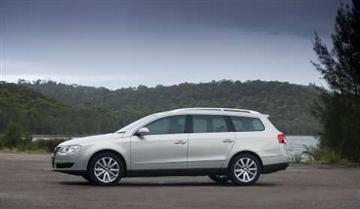 The Passat 2.0 litre 103TDI and the Passat 2.0 147TSI have been discontinued from the model line-up. The most popular Passat model, the 2.0 litre 125TDI, now enjoys the luxury of a Highline upgrade where distinguishing exterior features include sporty features such as a radiator grille with chrome plated strips, front fog lights and Monte Carlo 17x7½” alloy wheels, whilst new interior features include Napa leather appointed upholstery, sports luxury fronts seats, and brushed aluminium interior decorative trims. The Passat V6 FSI Highline has also extended its standard equipment list, which combines exterior features such as Chicago 18x8” alloy wheels and sport suspension with technologies such as 12-way electric front seats with 3 position memory for the driver as well as an automatic kerb function on passenger’s side exterior mirror when reversing and Media Device Interface (MDI). The sporty performance choice in the Passat range, the Passat R36, has been enhanced with dark tinted rear window and rear side windows (65% light absorbing) as well as Media Device Interface (MDI). These extra features complement the extensive list of standard equipment across the entire Passat range. In addition, more safety and comfort features are available in the 2010 Passat range. Driver assistance systems such as the “Adaptive Cruise Control (ACC)” with Front Assist for braking distance reduction is offered along with other high-end technologies such as the “Park Assist” parking assistant, “Adaptive Chassis Control” and “Lane Assist”. The latest version of radio navigation system, the RNS510, is available on the Passat Range. With new auxiliary functions like voice control the system is now even easier to operate. Pricing in the Passat range starts at $38,990 for the entry model 1.8 118TSI 7-speed DSG, while the top of the range Passat R36 Wagon with 6-speed DSG is offered from $66,990. Pricing excludes dealer delivery charges and the usual statutory charges imposed by state/territory governments.